This Day in Athens: 15 May 1856: "In plentitude, and even splendor..."
A blog from the Athens-Clarke County Library Heritage Room. The Heritage Room is located in the Athens-Clarke County library. We collect, preserve, organize, and make accessible resources about the Athens area, the state of Georgia, and the Southeastern United States. Let us help you with your research! Glean Information Galore from Our Newsletters! 21 May 1897: "Athens can beat that egg." Learn How to Share Your Story on May 21st! 9 May 1902: "No Contagious Diseases." 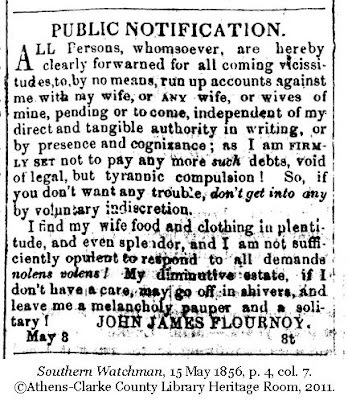 15 May 1856: "In plentitude, and even splendor..."
THE public will be re-assured to observe that I will pay nothing not cognisable by me as a debt! My wife alternately leaves me and returns, and is now re-absconded--uncertain whether or not to come home any more. My offence is inability to support her in the extravagance she wants. I can scarcely call a dollar my own. The genius of woman is the talent of Satan. She it is, as a tool--that brought all our woes; and she it is that MUST be overmastered! I would not give a thrip for such a society or liberty as we now have, until it be reformed in a thousand condign ways . So, no farther advice on this point. 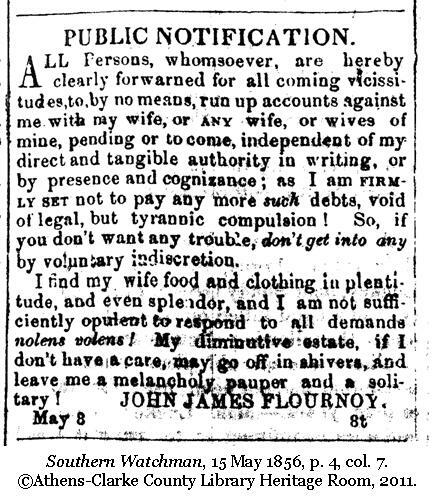 Beyond requests for local merchants to ignore his "wife, ANY wife, or wives," Mr. Flournoy also had run-ins with local businesses and neighbors that would be aired in overwrought prose amongst the ads for patent medicines, mills for sale, new shipments of goods, and county legal notices. Athens newspapers were not alone; he regularly wrote to papers all over Georgia, including Augusta and Macon, and religious publications. Mr. Flournoy was a resident of Jackson county. In Jackson county record abstracts, there is reference to both "J. J. Flournoy" and "John Jacobus Flournoy,"never a "John James Flournoy," but they appear to be the same person. According to Historic Notes on Jackson County, Georgia, John Jacobus Flournoy had been a native of Clarke, but moved to Jackson County in 1839. He lost his hearing and speech when he was young, and is considered instrumental in having the Georgia General Assmbly create the School for the Deaf at Cave Springs, Georgia in 1846; the school still operates today. In the book, Mr. Flournoy is described as "quite eccentric," and notes that he "wrote various articles expressing his dislike for society in general." In 1858, calling himself "Dr. J. J. Flournoy," he offered a cold preventative method for winter colds only; he admitted he had not yet found a way to prevent summer colds. In 1859, he requested that people not call him "old Flournoy," but rather "old Mr. Flournoy." By the start of the Civil War, his notices were no longer quite so florid, advertising for a lost horse, watch, and a runaway slave, and later being noted by the paper with other contributors to the Sick and Wounded Soldiers Wayside Home in Athens. In March, 1874, the Macon newspaper noted that J. J. Flournoy had "perhaps, written more letters, on more subjects, to more people than any man that ever lived or will live to the end of time." By the 1870s, his letters to the Athens papers were somewhat less frequent. An editorial in an 1886 Banner-Watchman mentions Mr. Flournoy as "lately deceased," and calls him "a gentleman of immense personal courage." His exact date of death is unclear, but his age is listed as 61 in the 1870 U. S. Census, so he was approximately 77 years old when he died. Southern Watchman, Jan. 1856 - Sep. 1858 on Microfilm in the Heritage collection. Athens Historic Newspaper Archive collection in the Digital Library of Georgia. Macon Telegraph Archive collection in the Digital Library of Georgia. 1870 U. S. Census in the Ancestry Library Edition database in GALILEO. Historical Notes on Jackson County, Georgia by Frary Elrod in the Heritage and general collections. The Southern Watchman, Athens, Georgia, Civil War Home Front Coverage, 1861-1865, abstracted by Faye Stone Poss in the Heritage collection. Confederate Athens by Kenneth Coleman in the Heritage and general collections. Women & Money: Owning the Power to Control Your Destiny by Suze Orman in the New Books collection. The Frugal Almanac by Melodie Moore in the general collection. Thrifty: Living the Frugal Life with Style by Marjorie Harris in the New Books collection. The New Frugality: How to Consume Less, Save More, and Live Better by Chris Farrell in the New Books collection. Women, Men, & Money by William Francis Devine in the general collection. What to Do before "I Do:" The Modern Couple's Guide to Marrige, Money, and Pre-Nups by Nihara Choudhri in the general collection. All Your Worth: The Ultimate Lifetime Money Plan by Elizabeth Warren in the general collection. Such a fascinating blog!!! We at Cecil County Public Library are incredibly honored to be nominated with you for the Salem Press award. Best of luck!